It's a new year. . . And a new me! This semester I vow to cook/bake and blog more often. I also promise to try more new (and exciting) foods--I already had some lamb shank just the other night. I will tackle my challenges in hopes of increasing my cooking skills and my palate. Truthfully, there were two things I missed in my life last semester, home-cooked meals (be them gourmet or not) and blogging. This year I am not ok without them, so now that I will have my evenings off--or at least I hope I will--I can devote them to this lovely blog--and making my stomach happy! I have no idea where to begin the story of what my life was like the last six months. I was happy and sad; relaxed and stressed; carefree and worried all at the same time. The second half of 2012 was one of the hardest semesters of my college experience--both emotionally and academically--but also one of the greatest. I'm not prepared to go into details because a) I don't expect you to read all about my issues and b) you can't expect me to tell you all about my issues. So lets just leave it at this: fall 2012 was different. Anyways, the reason I will have my evenings off is that I'm only taking one class this semester. Wait, don't tag me as a slacker just yet. For some odd reason, I failed to realize (last semester) that I only needed one class to complete my second minor and meet the graduation requirements. Either way I wouldn't have liked graduating in December though, so the situation worked to my advantage. I'm taking a once-a-week class and working four days a week. My arrangement is a smooth transition into the real world. I'll be posting more about my job and the excitement it's brought to my life, but for now here is some talk about food. I've recently entered a tofu stage. If I could have it all day every day I would, but who am I kidding, I would just end up hating it after a week. But having a tofu scramble once day--or sometimes twice--is definitely possible, so here's an idea. 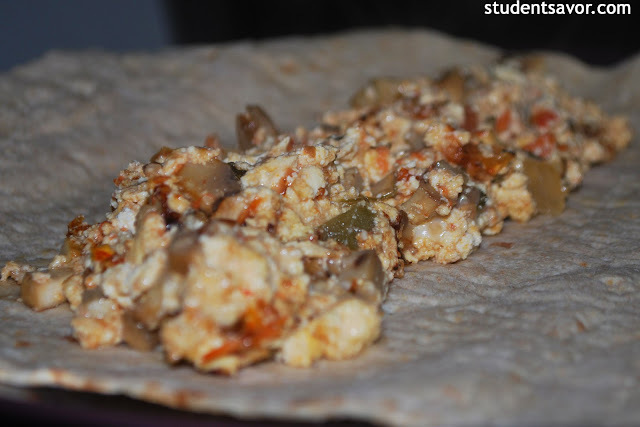 Take the best of a burrito and combine it with a cheesy tofu scramble and you get a delicious anytime meal. Plus, the best part of a tofu scramble is that you can add whatever chopped vegetable you're feeling for. Think of it like an omelet. The possibilities are endless. Active time: 15 minutes. Total time: 10 minutes. 2 tablespoons shredded mozzarella cheese. In a smal pan heat olive oil over medium heat. Sauté mushrooms and salsa for about 4 minutes, stirring occasionally. Season with salt and pepper. Using a fork, crush tofu until it resembles coarse meal. Add tofu to pan and cook for about 3 minutes. Add cheese and stir to combine; cook only until cheese is melted. 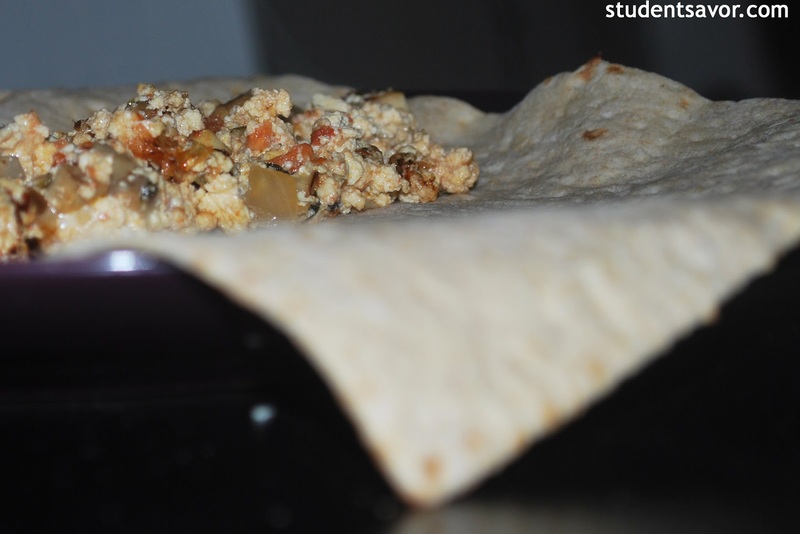 Place lavash flat on a plate. 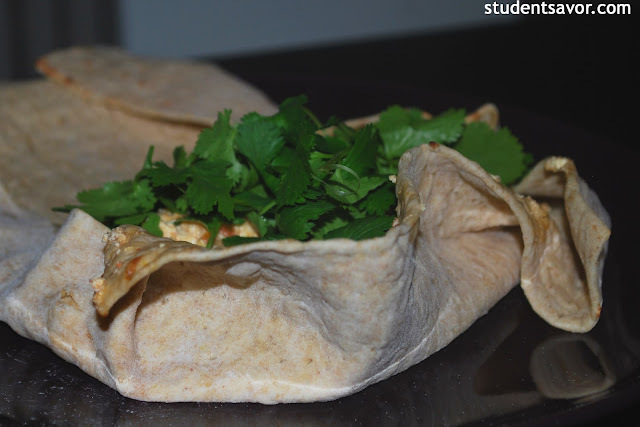 Put tofu scramble in the middle of the lavash and top with cilantro. 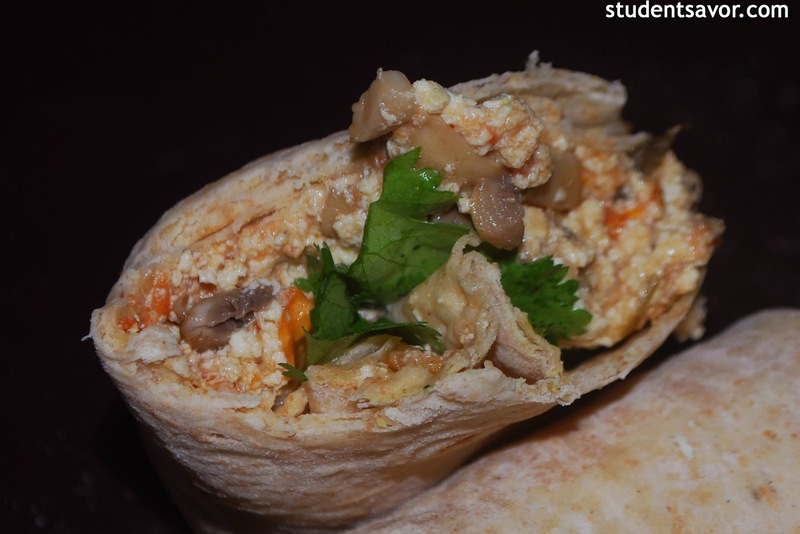 Fold in lavash corners and carefully wrap around tofu scramble.